Bruceswar wrote: Nice looking map, but a few of the numbers are semi hard to read. Such as the yellow in far south side, or the teal on teal. Any way we can fix that a bit? I can't make adjustments and see what it will look like without the actual colors of the numbers. The one provided comes in blue so I'm choosing the colors visually (unless they have more that I can't find) . How close they are now compared to the colors they're generating.... is unknown at least to me. If the colors were available we'd have a better idea. I could change the bonus color a bit and/ or increase the opacity and you'd be able to see it better on this version.... the one after its finished may be a different story. You're referring to the map with army circles ? Teal looks okay but yellow is difficult to see. Gray is the same way because there are so many different shades of it. EDIT: That's one of the reasons I did my update in neutral army colors until I found out. Scott-Land wrote: I can't make adjustments and see what it will look like without the actual colors of the numbers. The one provided comes in blue so I'm choosing the colors visually (unless they have more that I can't find) . How close they are now compared to the colors they're generating.... is unknown at least to me. If the colors were available we'd have a better idea. Transparent PNG image of the 88 digits used to represent XML generated numbers. any chance of extending the wicker park trees to turn it into a non-border region? even if u do this, the river west and near west bonuses can still do with being increased a bit, since they are so centrally-located. to value the el rail bonuses, an easy-to-remember rule is to have at least +1 for each station. here's a link to various bonus calculators if u haven't found them already, but beware that they always undervalue the middle bonus zones! the border between west loop and west town needs to be made clearer, since the black border disappears into the dark green shadow and we can't easily tell where it ends. keep going! we're nearly there! ketchup on your hot dogs, say it isnt so, thats not a chgo dog. On a side note recently a new hot dog stand opened up on western ave by 290 they are called Felony Franks, all of their employees are ex-cons. 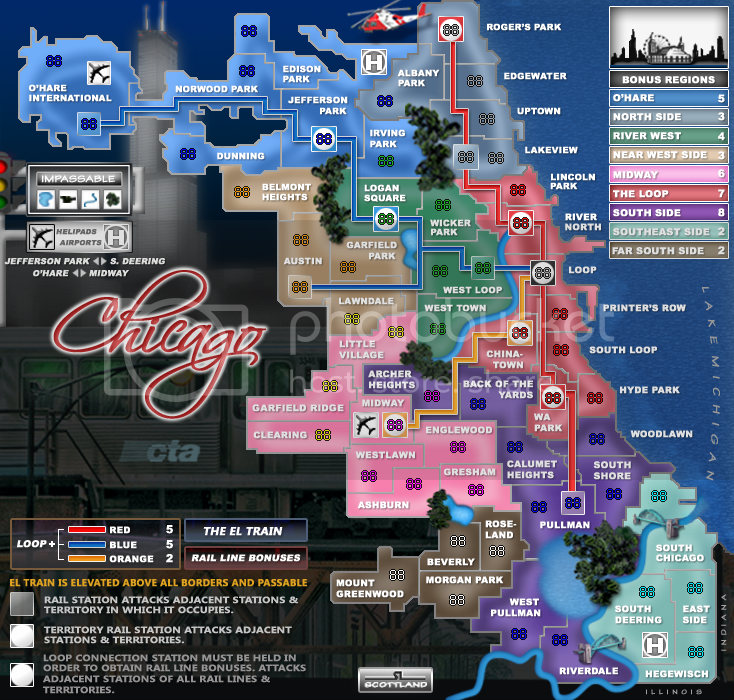 The coast gaurd helicopter is cool, and the map looks great, even better with the metra removed and the cta train added, nice detail. Hey, I live in Hyde Park. I resent it being included in the Loop. When the neighborhood starts at 51st. i would think that is pretty far south. I'm just being picky by the way, otherwise nice map. NoirXephon wrote: Hey, I live in Hyde Park. I lived in River North for awhile next to the Mercantile Exchange. If you're taking LS Drive, Hyde Park is about 10 or so miles south of the Loop. I drove past Soldier Field and Hyde Park almost daily on the way to Resorts to play poker. But South Loop is a bit too south I have to agree. It was either Hyde Park or Douglas... I chose Hyde Park. iancanton wrote: any chance of extending the wicker park trees to turn it into a non-border region? even if u do this, the river west and near west bonuses can still do with being increased a bit, since they are so centrally-located. to value the el rail bonuses, an easy-to-remember rule is to have at least +1 for each station. You mean an impassable from Lincoln Park/ Wicker Park ? I had an impass there at one point but got a lot of posts that said it was too hard to distinguish borders around the area so I opened it up. starting to look very crisp cant offer too much critisism cause i dont have the eye for it just havent been able to keep up withe everything in this thread lately . * Improved territory border viability. * Addressed Cairns and Bruce's issue with territory names/army #s -- changed bonus color. * Large map-- double digit army numbers. 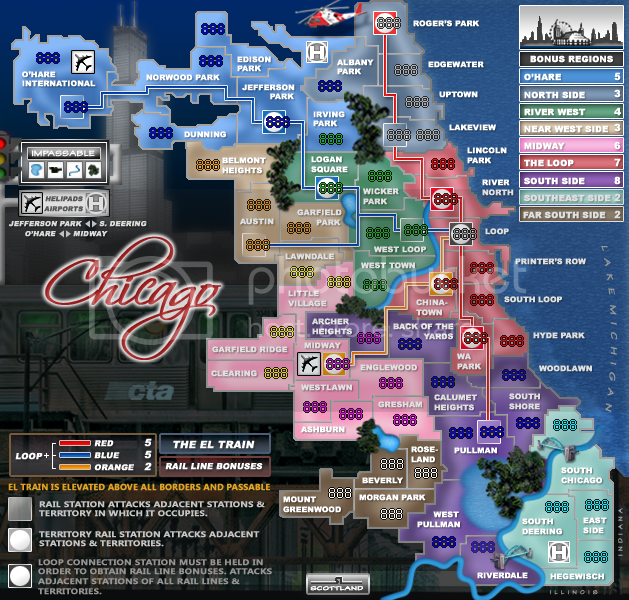 * Added territory to River West, removed bridge access from Loop / West Loop, now +4 bonus. I still like option 2 on page 9 better. The 3 territory bonus would give people a 3rd bonus to go for in dubs and trips games. Otherwise it will be about which team drops most of their men in the south. Although there is a fair amount of mobility with the rails and heli pads, so it may prove easier to move troops then im thinking. I would go with the 3 terr bonus, but that's just me. Looks nice scott. Georgerx7di wrote: I still like option 2 on page 9 better. The 3 territory bonus would give people a 3rd bonus to go for in dubs and trips games. Otherwise it will be about which team drops most of their men in the south. Although there is a fair amount of mobility with the rails and heli pads, so it may prove easier to move troops then im thinking. I would go with the 3 terr bonus, but that's just me. Looks nice scott. I tend to agree and that was one of the reasons I switched the rail so that it couldn't attack lakeview but that idea was received about the same as the 2 bonus up there. I can completely remove LRS ( Lakeview Rail Station). It would bring the bonus down to 5 terrs with 3 defending . Keep it at a +3. I think you should. Only the small bonuses come into play in most games. Large bonuses (asia on classic) might as well be no bonus at all. The more that people can actually hold, the more options to the players, and I therefore I think the more skill involved in playing the map. For the top right gray bonus, I say the smaller the better. My mindset was the same at the start of the map...but because of the size of the map, the consensus was not to have too many 2-3 territoy bonuses to prevent a player from auto-dropping the entire bonus at the start. Also if I creating a ton of small bonuses, it diminishes the importance of a territory. They become a stacking/defending territory instead of a positional one. Scott-Land wrote: I can completely remove LRS ( Lakeview Rail Station). It would bring the bonus down to 5 terrs with 3 defending . Keep it at a +3. Don't mean to be a pest, but I'm confused by this statement. Does this mean that the rail stations are needed in order to hold the bonus region that they reside in? In other words, the opposite of the system in NYC? You say "bring the bonus down to 5 terrs." I presume that means you consider it a 6-territory bonus right now. If this is the case (that rail stations are part of the bonus region in which they reside) I think a disclaimer on the map is necessary. Given the way the NYC map operates, I'd go into this map assuming that rail stations were only part of the rail bonuses. No, I just made a mistake posting without looking at the map. The territory bonus would be unaffected as the rail was never nor will be part of the North Side bonus-- would just be removing an adjacent territory that could break the bonus is all. You could no longer break from the rail into Lakeview . Thanks for pointing that out-- and no 'disclaimer' is needed. The mistake was made in my post not on the actual map. Think you may just be reading too much into it and I'm brain dead after work. Rail Stations are part of rails ONLY. Territory Rail Stations are part of territory bonuses AND rail bonuses multi functional. All there is to it. I understand your point, you may be right bonuses, it might play like bamboo sort of with another small bonus. Except with lower starting territory count. i see the point here about clutter. the bigger +4 bonus now makes it worthwhile to try to hold river west, especially with west loop no longer contested by the blue line. Georgerx7di wrote: Only the small bonuses come into play in most games. Large bonuses (asia on classic) might as well be no bonus at all. The more that people can actually hold, the more options to the players, and I therefore I think the more skill involved in playing the map. For the top right gray bonus, I say the smaller the better. i'm extremely happy with the new layout. there are 3 small bonus zones in the middle and 2 in the south; north side is 5-region, but easier than classic africa. as mentioned above, i'd make each of the rail bonuses equal to the number of stations on the line, since every single station must be defended to hold the bonus: this means +6, +6 and +3 for red, blue and orange respectively. look at making near west a +4, though the current +3 also works if u want to differentiate it from river west, which is more central and therefore likely to have more through traffic. so, what's the next step for this map? Georgerx7di wrote: so, what's the next step for this map? Let me first say that I think that this is one of the nicest looking maps that I have ever seen. The graphics are stunning and the gameplay looks like its going to be very fun. The connections between the airports and heli-pads are going to make this map epic. If I were to point out one thing graphically, I think the title graphics "Chicago" could use a little tweaking. To me it seems a little understated when compared to the rest of the map. I'm not sure if it needs to be slightly bigger or maybe just jazzed up a little bit. This is looking damn strong, Scott... I think there are a couple of graphical improvements that could be made (in some of the lighter terits, the gray borders don't really pop quite as much as they could), but the gameplay looks solid. Very well done indeed, good sir. You moved the helicopter, just noticed that.